"As soon as we were inside, one introduced himself as an FBI agent and showed me his identification. He introduced the other man as a law officer from one of the northern counties. Maybe you think I wasn't hastily reviewing my most recent sins as we sat down!" That line from Mac McGregor cracked me up! He was telling stories of his earlier Ham radio days to Barney during a lull in business in the electronics repair shop. The last anecdote concerns his service as an Amateur helping to establish and run a communications net during a spate of tornadoes in the Midwest - a scenario familiar to us now with the massive damage done by major Atlantic hurricanes this year. Dog-day doldrums had finally reached Mac's Service Shop. Customers were so busy enjoying their vacations and all kinds of outdoor activities that they simply ignored malfunctioning radios and TV sets. After all, a tired summer rerun on the TV screen was poor competition for a cookout in the back yard or just chatting quietly in lawn chairs beneath the stars on a balmy summer evening. As a result, there was not an unrepaired set in the shop nor an unanswered service call on Matilda's pad. Service benches were almost painfully clean and uncluttered; service instruments had been polished and recalibrated; reference books and replacements parts had been carefully and neatly rearranged. Mac and his assistant, Barney, were sitting side by side on the service bench swinging their legs and chatting. "Mac," Barney said, "I seldom hear you talking about working your ham rig any more. How come?" "Just don't have the time," Mac explained, loading his pipe. "You have to keep running hard just to stand still in electronics these days. As my wife will quickly and tartly tell you, when I'm home I usually have my nose stuck in a magazine or book. Sometimes I have the ham receiver going while I read, but I seldom flip on the transmitter. I know if I do I'll probably shoot several hours, for hamming is just as fascinating to me as it ever was." "As long as you've been hamming, I'll bet you've had some weird experiences." The FBI-Dillinger Caper. "That I have. One of the first was what I call the FBI-John Dillinger Caper. You probably know that back in the '30's John Dillinger, Baby Face Nelson, and the Brady Gang - not to be confused with the sweetness-and-light TV show called the Brady Bunch - all operated right through these parts. The Brady Gang ambushed and killed a state trooper by the name of Minneman and shot up our deputy sheriff, Craig, at the Caley Church just north of town. Dillinger himself is buried only sixty-five miles south of here at the Crown Hill Cemetery at Indianapolis. 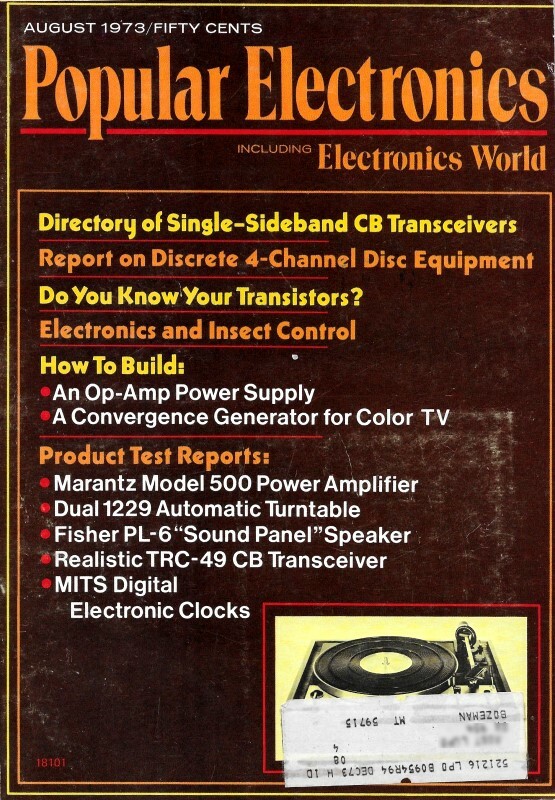 "While my rig was only a breadboarded self-excited TNT rig using a pair of '45 receiving tubes and inputting a sizzling thirty-five watts, I was quite active in the traffic CW nets. One day I was sitting out in the lawn swing in the front yard with some girls - wipe that unbelieving grin off your face - when a long black car pulled up and a couple of serious looking men got out. They said they would like to talk to me in private. While I was excusing myself, I noticed something odd about their car: it had a very thick windshield with about a two-inch round hole cut neatly through the glass on the passenger side, a hole. I learned later, for receiving the barrel of a rifle or machine gun. "As soon as we were inside, one introduced himself as an FBI agent and showed me his identification. He introduced the other man as a law officer from one of the northern counties. Maybe you think I wasn't hastily reviewing my most recent sins as we sat down! They wanted to know if I held the ham call, W9EGV, and if I had handled a radio message in the past three days, I cautiously pleaded guilty on both counts. Then they wanted to know if they could see the message. "I gulped and said, 'No, not without a court order.' It's not easy to say no to an FBI agent, but I knew showing my message log would be in violation of the Secrecy of Communication portion of the Radio Act. They wanted to see my license, which I showed them, and we sparred around for a few minutes. Finally I said, 'Look, you fellows want to know something. I'm willing to help if I can; so why don't you just ask me?" "'O.K.," the FBI man said, "we have a message with your call as the station of origin, making a date for John Dillinger to meet Baby Face Nelson at a little town to the north of here. On the strength of this, we've had fifty men lying in wait up there for two nights. As you might guess, we checked you out pretty thoroughly before we came, and we think the radiogram is probably a hoax, but we still have to make sure. That's why we'd like to inspect your log." " 'In that case, be my guest,' I answered, heading for the ham shack. Was I ever glad my log was right up to date! I was dead sure all my transmissions had been monitored around the clock for the past few days. The only message I had handled recently was one I had picked up from Kentucky and had relayed into Chicago that very morning. It was one of those innocuous arrived-safely-will-write-soon type. Satisfied I was not a Dillinger henchman, they asked me not to say anything about the affair. I pointed out that if someone were using my call I wanted to report it to the FCC before he got me into more trouble. They said to go ahead and report the suspected bootlegging of my call and refer the FCC to the FBI for further details. I did, and six months later I got a notice from the FCC that everything had been cleared up to their satisfaction. I never learned any more. The FBI, understandably, is much better at collecting information than at putting it out." "Wow!" Barney exclaimed. "Got any more wild stories?" R-F Burn Treatment. "Lots of them. Here's one a little more amusing. My sixteen-year-old cousin had a wart on her hand and asked if I could take it off. I had discovered I could tune up the pi-network coupler of my transmitter so that it would develop a very high r-f voltage, enough to leap a quarter of an inch at the end of a short antenna. I discovered this by burning myself with it on several occasions. I came up with the stupid and dangerous idea that I could burn the wart with this r-f the way a doctor would do with an electric needle. Remember I was only twenty and had no idea of the possible grave consequences. "She was all for it; so, really hamming it up, I rigged up a wooden-handled ice pick for my 'needle' and got ready to operate. We were both laughing and giggling, and when the little blue flame leaped to the surface of the wart she let out a bloodcurdling scream. Our voices vibrated the '45 tubes in the transmitter, and at least one of them must have been microphonic. A fellow ham a few blocks away tuned in to my carrier, and he could hear us laughing and giggling and her screaming, and he actually recognized my voice. He came pounding over to see what was going on and to find out how I made my CW transmitter put out a radiotelephone signal. I'm sure he was disappointed all the way around at what he found." "Did the wart go away?" "Strangely enough it did, although the r-f only burned a tiny white spot on the top of it. Probably rubbing it with stump water or castor oil or tying a horsehair around it would have achieved the same results. The Telephone Company. "Another time the telephone company called and asked if they could run a loop from one of their long distance lines into my house so that I might decipher some high speed code that mysteriously appeared on that line every afternoon at precisely four o'clock. Naturally I was all for this, and they ran the loop into my ham shack just shortly before Christmas. "At four o'clock, right on cue, the CW started. It was only about twenty words per minute, and I had no trouble getting it down on paper. Apparently it was concerned with bootlegging - remember this was in the prohibition era - and was placing orders for case lots of whiskey and gin and wine. It only lasted two or three minutes and seemed to be a one-way transmission. The telephone people told me there was no change in resistance on their lines to indicate a direct tap and that they had patrolled every foot of that line without finding anything wrong. They decided the freeloaders were using inductive coupling to put the message on the line and to pick it off, probably by simultaneously raising inductive couplers to the line at remote spots. They thanked me and took the message I had scribbled down for them. Two weeks later they called to say the code had disappeared. I don't think it ever reappeared." "Ham radio really involved you in some interesting things." International Events. "Yes, and on at least two occasions it gave me a front seat on events of international interest. On that October morning, 1957, after the Russians put up Sputnik 1, I hooked up with a German station. The operator had just come home after working twelve hours at a tracking station, and he was tremendously excited. He gave me almost the precise orbit of the little satellite, told me its operating frequencies, and described when it would be passing over the U.S. Armed with this information, I was able to tune in and record the lonely little beep-beep-beep close to WWV's frequency, and I still prize that recording. It was at least thirty-six hours before the news services published most of this information. I offered my information to our local newspaper, but they were afraid to print it because they had not received it over their news service wires." "On the morning after the Anchorage, Alaska, earthquake of 1964 I contacted a station operating on emergency power at the hard-hit airport at Anchorage. The operator told me, 'Mac, I'm listening to what your radio stations are saying about the fatalities here, and they are grossly exaggerated. We have some people killed, but not thousands as they are saying. Believe me, I know what I'm talking about.' Again I relayed this to our local newspapers, but they were afraid to print it. "When deadly tornadoes raked this state on Palm Sunday, 1965, I sat at the ham rig for thirty-six hours straight because one of the hardest hit areas was just twenty miles south of here. I've also worked in Ohio and Mississippi River floods, in Florida and Gulf Coast hurricanes, in blizzards, ice storms, and forest fires. Many times, unless I was sure I could help, I just listened; but always I felt as though I was there, right in the midst of the action, ready to help if needed. As you well know, it is often better for an emergency net to be controlled by a station entirely outside a disaster area. He has reliable power and good landline communications; he is not subjected to the hectic and emotion-charged conditions prevailing in the area; and, quite often, skip conditions enable him to copy clearly weak stations in the disaster area that cannot read each other. "The point I'm trying to make is that ham radio is a hobby that has all the elements of romance, plus, as a big bonus, a chance to improve your electronics prowess."